The informal meeting of the defence ministers of the European Union was held on 30 and 31 January in Bucharest, in the context of the Romania’s Presidency of the Council of the European Union. 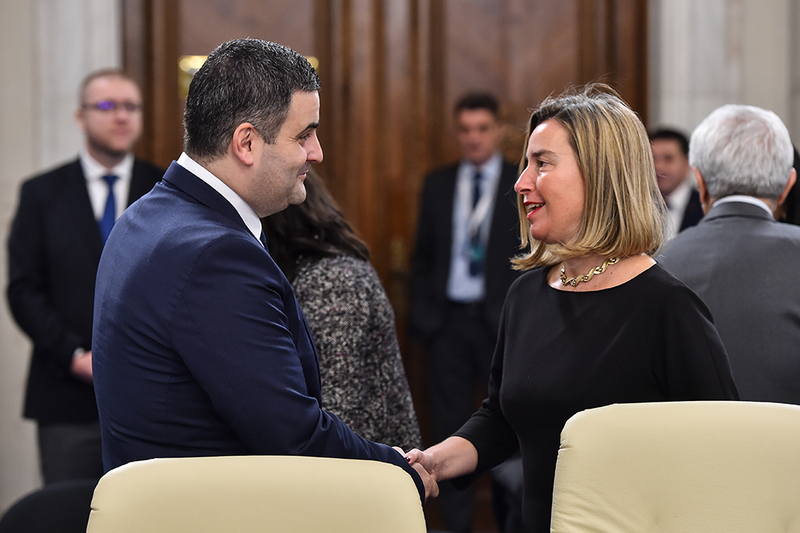 Chaired by the High Representative of the Union for Foreign Affairs and Security Policy, Federica Mogherini, the reunion represented an excellent opportunity for a common reflection and an exchange of views to strengthen the European project from the security and defence perspective. The debates of the first working session were attended by NATO Secretary General, Jens Stoltenberg and the UN Deputy Secretary-General for Peacekeeping Operations, Jean-Pierre Lacroix, and have been focused on the implementation of the „Women, Pace and Security“ agenda, together with the perspective of future commitments and actions that should lead to ensuring gender equality on the security and defence dimension. In this context, the wider framework of cooperation between the three organizations with regards to the international crisis management was also approached. In his address, the Romanian Minister of National Defence, underlined the importance that Romanian Presidency of the Council attaches to strengthening NATO-EU cooperation, the transatlantic bond and the EU-UN strategic partnership. He stressed the importance of gender equality efforts and the implementation of optimal measures on this dimension, and expressed Romania’s support for the steps taken by the EU in order to implement the Women, Pace and Security agenda. Consistent with this view, the Romanian defence minister has underlined the fact that gender equality had to remain a fundamental objective, which should be included and make a contribution to the mechanisms associated to conflicts prevention as well as peace building. The second day, during the session on the future of European defence, the ministers had a thorough discussion on the state of play and progress made in implementing the EU’s Global Strategy for Foreign and Security Policy, focusing on coherence of defence initiatives such as Permanent Structured Cooperation (PESCO), Coordinated Annual Review of Defence (CARD) and European Defence Fund (EDF). The defence ministers also addressed a series of issues related to implications of innovation and research and development as well as technological progress on the development of military capabilities. It was emphasized the increased dynamics of technological advances in the civilian field with a potential impact on the military side. The Romanian minister of defence, Mr. Gabriel – Beniamin Leş, has emphasized the great oportunity for an additional boosting of EU’s efforts on security and defence, highlighting the fact that the achieved progress opens the way to a consolidation stage, focused on a successful implementation, correlation and interconnection, but which requires today a better coherence amongst these initiatives. Therefore, the Romanian official expressed support for upholding the current direction of EU’s action, mainly focused on developing the EU’s profile as a global actor, starting from the recognition of NATO central role in ensuring the European security and defence. In this context, the Romanian minister of defence has underscored that the transatlantic relationship remained essential, a stronger Europe on defence dimension could not be feasible without a tight link with transatlantic partners. On military mobility, he highlighted that Romania will pay a special attention to the Action Plan, based on a pragmatic, coordinated approach at the EU level. In this regard, both the transport infrastructure and procedural and legal aspects become essential. In the same time, Mr. Leş has noted the impact that the intense rhythm of civil innovation has on the military field of activity and highlighted the added value new technologies can bring in the areas relevant to ensuring military superiority.